To cling or not to cling, that is the question, at least for the purpose of this post. Clinging is a rather fascinating word because it includes so many adaptations. 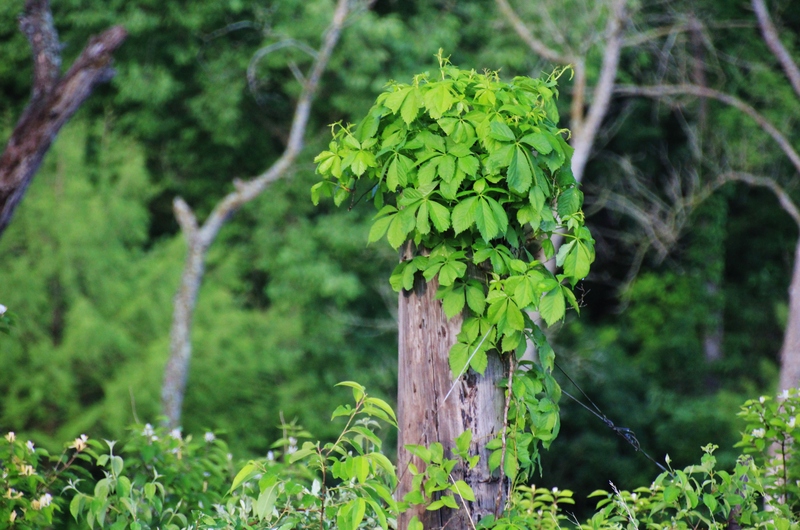 Consider this photograph of a creeping vine steadily growing up and around this old wooden post…clinging to it like a cat who injects her claws in your flesh after an aerobic jump from chair to shoulder (I know this scenario well). Or, consider how a small child clings to his mom when he is uncomfortable in a particular situation-mom couldn’t pry the child off her with a crow bar. What about clinging to something for safety. Think of grabbing onto a rock wall as the ledge underneath you gives way. There is no chance you will release your grip until you secure firm footing, someone rescues you or you simply can’t hold on any longer. And then there are the endless objects which we cling to for security and the numerous people that we cling to for all manner of reasons. Our clinging isn’t limited to the tangible, but also includes concepts, theories and dreams. Clinging: it denotes the positive as well as the negative. So, as I considered the vine clinging to the post I thought of things I cling to…or have clung to in the past. Wow, did that thought break open Pandora’s box. BTW, I don’t know Pandora, but she sure does get credited for many things! Perhaps you can relate to some of these examples. I have clung to habits which seemingly provided security or comfort at the time, but I either outgrew them or became aware of what they really were…crutches. I have clung to other people in the hope that they would make me better or bigger somehow. This type of clinging usually ended up in disappointment. I have clung to ideas which shaped my outlook on life; some helped me grow and some didn’t. I have clung too tightly to a few I have loved which suffocated them and exhausted me. On the flip-side I have clung to values and principles which have positively guided me. And, I have clung to truths which have shaped my response to many of life’s uncertainties and challenges. Currently, I am clinging to the hope that the future will be brighter, better and more fulfilling. Perhaps such clinging may prove to be counter-productive, but I am hoping that is not the case. I strive to cling to the Old Rugged Cross, especially in times of trials and pain. This clinging is always beneficial, but too often lacks consistency. I am drawn to cling to that which I find familiar, helpful or distracting. Familiar clinging brings a sense of order and security. I would describe helpful clinging as anything which benefits the person without having poor side-effects. Clinging is such an easy way to cope with the difficulties of life. It really doesn’t matter what the distraction is as long as it works. Problem…distractions don’t last very long and must be repeated to keep one’s mind off the thing they want to avoid. So, we tend to cling onto these more and more. This type of clinging can often become destructive to the person and relationships. Since clinging can be beneficial or harmful (my humble opinion), the outcome depends on what the object is that we cling to and the reason why we choose to cling. This is cause for serious self-evaluation from time-to-time. We don’t want to be too serious too often for that dynamic creates the opposite of clinging…namely fleeing. However, it is wise to pause once and again to consider what it is I am clinging to, and to ask oneself if it is healthy. One of the most wonderful things to cling to isn’t an object, a relationship or even a concept. It is actually best described as a feeling, although it is also referred to as an expectation. The word which describes this feeling of expectation is hope, and without it we dry up and give up. Without hope, life becomes dull, boring, predictable, worthless, and simply undesirable. To the contrary, when one is full of hope life has purpose (no matter how difficult or tragic), more meaning, more wonder, and certainly more joy than a life void of it. To be without hope is to be filled with a sense of dread and impending doom. Such a tragic way to view and live life. But, alas, many do live this way. So, here is a toast to living with hope. Hope that a loved one will come home from foreign soil. Hope that a relationship will mend. Hope that a loss won’t be the end of things. Hope that there is a God who really does care and is in control. Hope that He loves you and you find Him. Hope that the sun will rise tomorrow and birds will sing their joyful songs. Hope that babies will grow old. Hope that older adults don’t become children again. Hope that one will always have a friend or two to count on. Hope that nothing can destroy one’s integrity. Hope that children in impoverished nations will be fed, clothed, educated, treated with dignity and allowed to become responsible adults. Hope that wars will cease and hunger end. Hope that cancer will be beaten. Hope that life has more pluses than minus’. And the list goes on and on. There is enough hope to go around for everyone so give hope a try…even if you aren’t up to it. As the Apostle Paul so eloquently expressed in his famous chapter on love (1 Corinthians13), “These three remain: faith, hope and love”. 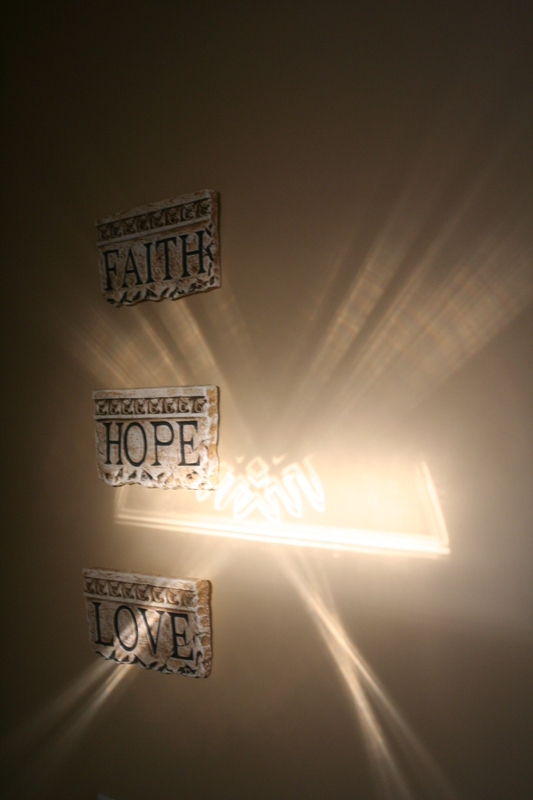 For hope to be bookended by faith and love makes it a very important verb to live by. May we all experience the blessing of hope every day of our lives.